The Russian Navy’s interest in lighter-than-air flight began in the late 1880s, with tethered balloons lofted from shore bases to spot enemy ships over the horizon. By the turn of the century both the Baltic and Black Sea fleets had small balloon establishments, and over the next several years the navy began experimenting with balloons launched from ships at sea. 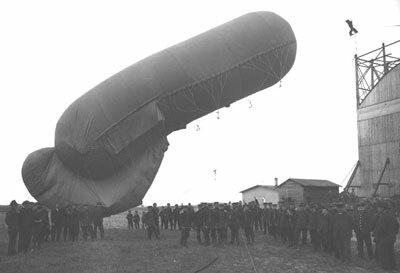 Suggestions for a dedicated balloon ship first appeared in 1901, and became serious in 1903 after the Russian balloon expert M.N. Bolshev returned from an inspection of the French balloon ship Foudre. In early 1904, war broke out between Russia and Japan, and both sides suffered losses from mines. Russian army engineer Capt. Fyodor A. Postnikov had been experimenting with locating sunken ships by air, and suggested that balloons might be very useful in mine detection. Count S.A. Stroganov, a wealthy former Russian naval officer then living in Paris, was anxious to help his Tsar and country and offered to present a balloon ship to the Navy. Stroganov’s agents located and purchased the German passenger liner Lahn, and contracted for the conversion work to be done in Bremerhaven. The count also purchased four Parseval-Sigsfeld kite balloons, a spherical observation balloon, winches and hydrogren-generating gear from a German firm, and when the German government refused to allow Stroganov to buy guns for the ship, he acquired four 3-inch guns and 10 six-pounders in Britain. Bolshev went to Germany to supervise the work, and a very sophisticated vessel emerged in late October 1904. A Parseval-Sigsfeld kite balloon. Rus carried four of these. When aloft, the observer would communicate with the ship by telephone. The ship carried 1,000 meters of line, and heavy steel cables to hold the balloon. Winches would raise and lower the balloon. An independent system of steam engines and dynamos powered the gas generation plant. Though the ship carried five manned balloons plus two smaller ones for communications, only one would be aloft at any one time. Lahn arrived in the Russian port of Libau the next month, and per Stroganov’s wishes was commissed as the cruiser Rus. She sailed for the Far East as part of the Third Pacific Squadron in February 1905. Five days into the voyage, off the northern tip of Denmark, her troubles began. Stroganov’s willingness to help the navy only went so far. When presented with several ships from which to choose, he had picked the cheapest option. Lahn had been launched in 1887 and served on the storm-tossed North Atlantic route for 17 years. By 1904 she was a battered hulk, with weak machinery and suffering from pervasive rust. When her condensers broke down, her captain was ordered to take her back to Libau for repairs. Along the way, Capt. Kolyankovsky conducted more tests of his balloons. One was damaged by crashing into the hangar, and one of the unmanned ballons intended to loft a wireless antenna broke loose and floated off past the Swedish coast, never to be seen again. After repairs at Libau, Rus remained in the Baltic to test her aviation component. Her crew made 186 manned ascents during the summer of 1905, and became quite good at their tasks. But the constant sea haze over the Baltic limited visibility, and the naval staff decided to transfer Rus to the Black Sea. Rus’ poor material condition doomed this plan. Though the aeronautical gear was top-notch, her officers reported they did not believe she could survive the journey around Europe and they suggested that her balloons and gear be removed and transferred to Sevastopol by rail for installation in a better ship. The new Navy Minister, A.A. Biriliov, had never been a supporter of aviation and agreed. But in the cost-cutting mood that followed the disastrous end of the Russo-Japanese War, he apparently had no intention of following through. The equipment was left in a warehouse, while Rus went to the scrapyard. Loft your balloons! Order Russo-Japanese War right now!